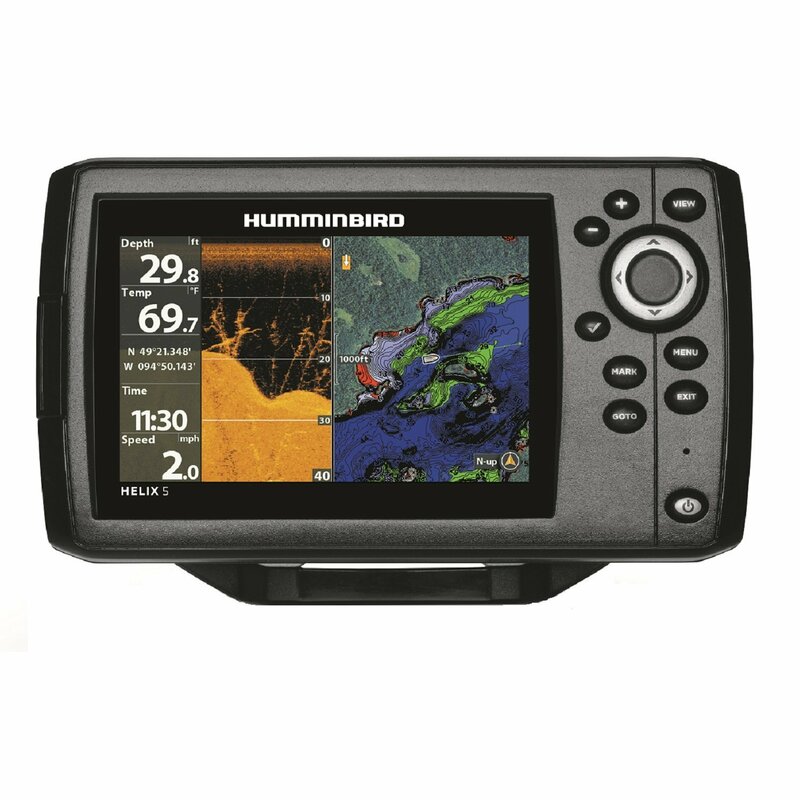 Humminbird PiranhaMAX 143 has an average rating of 5 out of 5 based on 3 user reviews. The fishing experience will transform instantly from the minute Humminbird PiranhaMAX 143 is fitted onto a boat. Crafted with intelligent technology and a streamline design, the PiranhaMAX 143 is making its mark on the fishing industry. This fish finder is one of the most innovative on the market at the moment, and this is due to it possessing 600 depth capability and a 4-level grayscale display. Simple to install and equipped with a distinct screen, the Humminbird PiranhaMAX 143 will not disappoint. No fish finder would be complete without an eye-catching design and the PiranhaMAX 143 scores highly in this department. Suitable for most boat types, this device has rounded edges, an adjustable screen and large buttons. The display on this item is 160V x 128H 4-level grayscale, which makes it possible to distinguish the intensity of each pixel with ease. This 4-level grayscale can be viewed on the 4-inch screen, which has a peak-to-peak power output of 800 watts and an RMS power output of 100 watts. The Dual Beam Sonar feature offers users coverage of 83 kHz/60° @ -10db and 200 kHz/20° @ -10db. This advanced sonar technology is relied on to display accurate information from beneath the water in a basic and understandable format. The 600 ft. depth is what entices most buyers to invest in the Humminbird PiranhaMAX 143, because this feature delivers users the opportunity to catch prey in most lakes. Detecting the location of fish based on the temperature of the water is simple when you buy the PiranhaMAX, which is complete with a temperature display. Highly accurate sensors are critical when seeking out particular species of fish, and when this temperature feature is employed on a regular basis; you can improve your aptitude and fishing technique as an angler. Temperatures are continuously updated when using this device, giving you complete fidelity when gathering fish. Waterproof and fitted with a backlight, the PiranhaMAX is suitable for use in all environments. Proving to be competitive when compared against other fish finder products, this device promises each fishing trip to be successful. Waypoints can be marked when utilizing this device, your track can be viewed, and zoom can be activated for a better look at your prey. When you combine this with depth alarms, fish alarms, Course over Ground view and the upgraded contrast display, fishing attempts will be straightforward, even when using the tool in direct sunlight. What buyers seem to enjoy the most about the Humminbird PiranhaMAX 143 is its tilt mechanism, which is useful for when using the device from different positions. On average, it is seen to be a much more dependable item than competitors, and when considering the value for the money, the PiranhaMAX 143 crams an exceptional amount of features into its build. Rated 10 out of 10 for ease of use and efficiency, this Humminbird product is proving itself to be a bargain buy that can be used on a frequent basis. You can get a great deal on Humminbird PiranhaMAX 143 here. This is the 3rd PiranhaMax model that I’ve used and so far they’ve all performed very well. Very inexpensive and finds fish, what more could you ask for. This technology has come a long way since I bought my last unit. Last time I was shopping for a new unit a fish finder alone cost as much as a low end GPS/sonar equipped unit does today. I was originally in the market for a depth finder and discovered that this unit cost less than the most inexpensive depth finder I saw. I have owned 2 previous Humminbird units and this one performs as well as I expected. They are a great company and I will stick with them. Really affordable unit that works great. This one went on a float tube using a third party mounting system and has exceeded my expectations. It shows temp, depth, and structures which help locate good fishing spots. It is compact and easy to set up on any craft.